Four quarterfinal matches, just five goals scored and only one of these did not come from set pieces. This would be Gonzalo Higuain’s 8th minute goal for Argentina against Belgium, shot with alacrity on the swivel from a propitious ricochet. It was Higuain’s first of the World Cup, shot more in hope than anything but with such quickness that Thibaut Courtois in the Belgian goal did not even have time to react. That momentary bit of opportunism from the Argentine was enough to propel his country to a delectable semi-final against the Netherlands. Of all the remaining teams in the World Cup, Argentina is the one that seems to be doing enough just to win. For all their possession, the Belgians lacked guile in the attacking third and did not really put the Argentine goal under real threat until late in the game. They looked good but raw; and we can all probably expect more from them in Russia four years from now. It was Argentina’s third 1-nil win of the World Cup. Still underwhelming, yes; but just as they were in the 1986 World Cup in Mexico which they won, by the way. With Germany contesting the other semi-final against host team Brazil, dare we all expect a repeat of the 1986 final between Argentina and Germany? Fearless forecast for the final? On the basis of form in the quarterfinals, Argentina versus Germany. But I have been in the game long enough to know that the form books is always being thrown out the window. The Germans certainly looked the part in their own 1-nil win over the French. On the basis of quarterfinal form alone, I would happily nominate Germany as champions-elect. While the Argentines looked laboured after taking the lead over the Belgians, in contrast the Germans continued to look enterprising after scoring their own early goal. The French were no pushovers and played, in my opinion, some of the sharpest football of the tournament up to the Round of 16. Germany, of course, was an altogether different proposition. They kept their shape throughout the game, not an easy thing to do in tropical conditions. They showed poise and ability in defending a one-goal lead along with elegance and fluidity in trying to add to it. In other words, the Germans are beginning to click into gear at the right stage of the tournament. This is not to say that the Brazilians are to roll over for the Germans, far from it. However, their laboured 2-1 victory over Colombia was again far from convincing. Both their goals came from set pieces, the first gifted by Colombia’s Carlos Sanchez, whose failure to spot Thiago Silva lurking behind him was schoolboy defending. The David Luiz special, of course, was something to behold live; until the slowed down replay. Then suddenly, one began to wonder of the goalkeeper could have done a bit more. The ball was not really all that far out of reach. Maybe this is just me, but this game was the second of this World Cup when I felt that the Brazilians were getting the lion’s share of favourable calls – or non-calls, if you think of things the other way around. 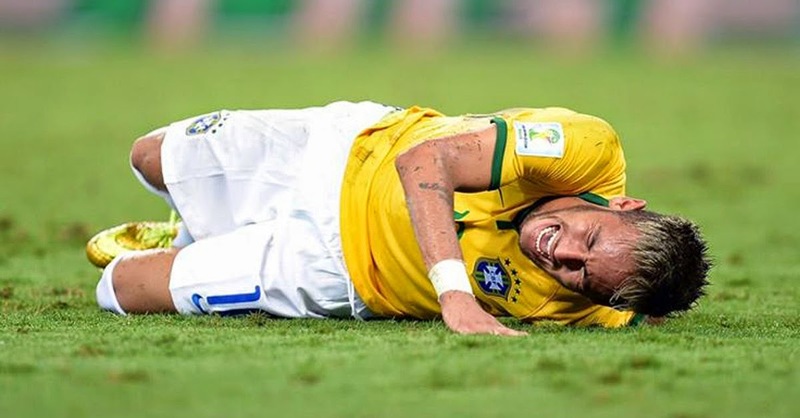 The foul on Neymar was hideous and I am saddened that one of the World Cup’s shining lights will be taking no more part in it after a fracture of the vertebra. However, even after watching the replay, I am not totally convinced that the knee was planted on his back with the aim of maiming him. It looked just like one of the many robust challenges that I have seen in this World Cup alone; and God knows that there had been worse. I think the injury was more a combination of bad luck and Neymar’s rather light frame. Anyone who has seen clips of the 1966 World Cup in England when Pelé was taken down by some really unscrupulous Portuguese tackling will understand that, in comparison, the foul that felled Neymar was rather innocuous. Pelé was not even being tackled. He was being scythed down mercilessly. Luis Felipe Scolari said something about Neymar being ‘hunted down.’ True. But then, that is the price every top player has to pay for being as good as he is. I do not hear Lionel Messi complaining. Ditto James Rodriguez of Colombia, who had delighted this World Cup with his sublime skills. Why did I not even know about him before June? But to get back to the point, Rodriguez was the object of some none-too-subtle Brazilian thuggery throughout the match, convenient for Scolari to forget. Under his instructions, I would surmise. Of the four quarterfinal matches, Netherlands v Costa Rica wins Bore of the Tournament – hands down! I was on Facebook while watching it. Particularly in the first half, absolutely nothing was happening. There was romanticism in the way Los Ticos got out of the group stages by defeating two former world champions and drawing with one; but there was nothing romantic in the way they approached the Round of 16 and quarterfinals with the mindset of trying not to lose as opposed to trying to win. The Dutch, perhaps, also contributed to the bore draw with their negativism. And somebody please explain why Robin van Persie is supposed to be a top class striker. His Flying Dutchman goal apart, he has often looked in this World Cup more lost than the Dead Sea Scrolls. In fairness to the scrolls, they were discovered. The English would do well to arrange a friendly chat with their neighbours from across the channel after the Dutch won their first ever World Cup penalty shootout. The insertion of Tim Krul for the shootout alone was a tactical masterstroke; for it was he who saved two penalty kicks. But what was more important was that the Dutch did not miss theirs.